After consulting the top cell phone companies in Spain, our Spanish SIM card recommendation for the academic term 2018/2019 is Lycamobile! 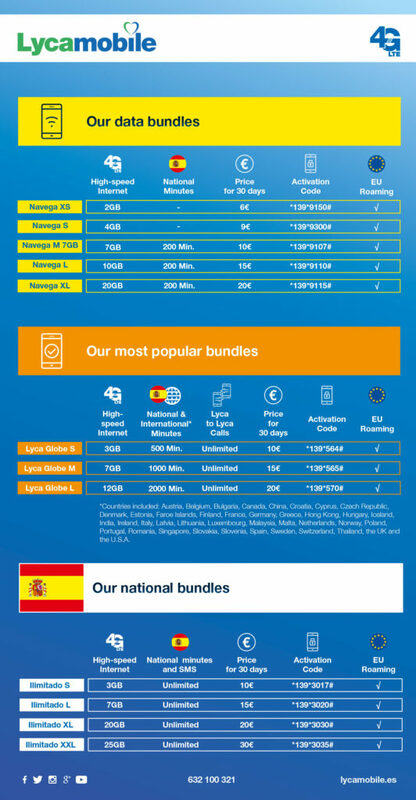 Lycamobile is one of the biggest cell phone providers in Europe offering different, cheap bundles that you can choose from. You can obtain your free SIM card either online on www.lycamobile.es (delivered to your home) or at retailers like Carrefour. You can also get one at one of the many “Locutorios” all over the city. Spread the news among your friends, it will save you a lot of money! If you have any questions, don’t hesitate to contact us at info@citylifebarcelona.com. Please note that all fields are required fields.